If you’re a recently divorced dad, be prepared to see a side of your kids you’ve never seen before. Kids who have been through a divorce often act in certain ways. As a single dad, you need to know what to watch for—and how to respond. Here are some common things to look for, from Ken Parker and Van Jones in their book, Every Other Weekend. First, kids sometimes take advantage of two different sets of house rules. “Mom lets me do this at her house!” They may be telling the truth, or pulling a scam. The best thing you can do is to help them understand that you’re going to stand behind your rules-and the values they represent. Express confidence that they can adjust when they’re staying with you. Second, your child may purposefully break your rules. Correct her in love, but also use the opportunity. She could be expressing anger. Or she maybe testing your love and limits. In either case, be firm but gentle. Don’t respond in anger, instead talk with her about the way she’s adjusting, what she’s going through, and how you can help. Just listening may be all she really needs. 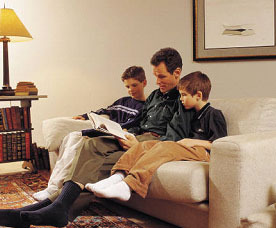 The third typical response is for a child to complain about someone at the other household-his mother or stepfather. You need to be very discerning here. On the one hand, you’re probably only hearing one side of the story. You could try calling his mother-not to make accusations, but simply to communicate what you’ve heard and gather facts. Often, getting the rest of the story will give you a better appreciation for her point of view, and you’ll be able to back up her actions. On the other hand, what if your child has a legitimate concern? That phone call to Mom could betray his trust, and could get him into trouble at home. These situations illustrate the importance of communicating with your child. Does he need you to act on his behalf and look into the situation? Or does he simply need someone to talk to? For all dads, regular healthy communication will build a trust level that’s going to come in handy when stresses and crises come along. For divorced dads, you’ve got to work at it twice as hard in half the time. May God bless you.